It's time for Challenge #292 at Little Red Wagon. Heather is bringing us this week's challenge and she wants us to use something in our stash we haven't used before. She is calling this week's challenge, USE IT UP. I like it!! 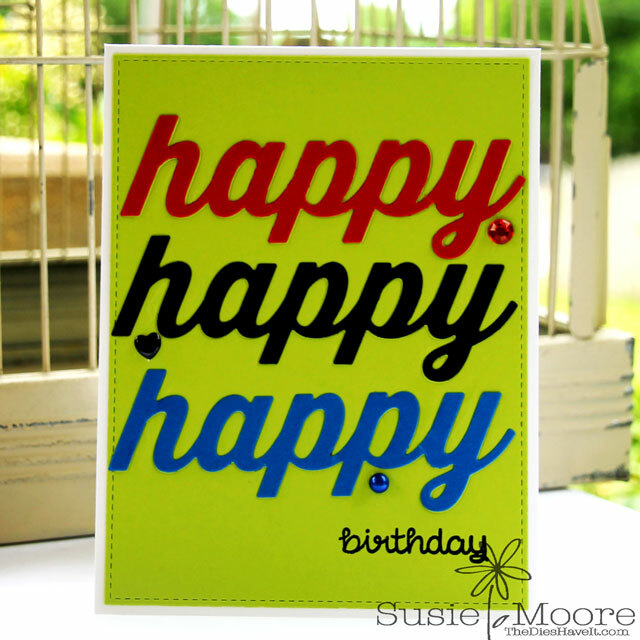 Confession time: I just HAD to have these Happy Duo dies from MFT Stamps. And then I never used them. But now that I have, I love them and will be using the set again very soon. (I promise). What's in your stash? Be sure to join in the fun and share your creation with us. And be sure to visit the other girlfriends' blogs to see what they have created to share with you. See you tomorrow. Until then, have a HAPPY day! Fab card, Susie! Loving the bold colours. This card makes me HAPPY! Love the colour and a great way to get use of the die by having the sentiment repeat! Great card. Great colours on this bright and HAPPY card. Glad I could inspire you to use something new from your stash.